Doug Fehan took several seconds and one step backward on Thursday as he attempted to answer a question about two of his favorite subjects; the Sebring 12-hour race and Corvettes. Finally, Fehan, General Motors’ program manager for Corvette Racing, hit on an answer which seemed to satisfy him after he was awkwardly asked: Um, er, duh, what does Sebring mean to Corvette? “It cuts both ways,” Fehan said, during a telephone conversation. “It’s been a wonderful confluence. The two, also, will also be celebrating anniversaries this weekend. Separate anniversaries. But, anniversaries which are also not-so-circuitously co-joined. The race and Corvette, both turn 60 years old this weekend. 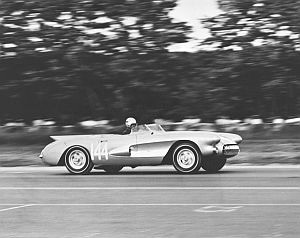 The iconic Mobil 1 Twelve Hours of Sebring sports car race and the marque which is viewed by many as America’s first – and only – true sports car both made their debuts in 1953. Memories of SRs and and SSs; of small blocks and big blocks; of two-speed automatics and four-speed manuals; of GTs and prototypes; of factroy efforts and privateers; of the American Le Mans Series and of IMSA Camel GT; of The Flying Dentist and of Johnny O.
I asked Fehan if he thought there was a “golden era” for Corvette at Sebring. Yep, he said. And that would be, he said “very selfishly”, the period which started in 1999. “The reason I say that is because that is first time, as I put this program together and presented it to (GM racing boss) John Middlebrook under the direction of Herb Fishel, we were going to have a full-fledged, above-board, resource-dedicated racing program that was befitting of the name Corvette,” Fehan said. “The factory was actually going racing with the car. That had never, ever happened before at that level. Fehan did say that drivers like Ron Fellows, Andy Pilgrim, Kelly Collins, Johnny O’Connell and Chris Kneifel would certainly attend that party. And with good seats at the party would be the Earnhardts – Dale Sr. and Dale Jr. 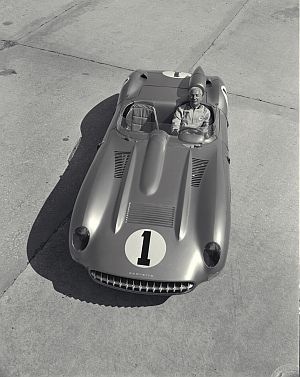 The Corvette SS at Sebring. 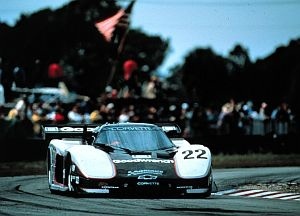 2001 and begins at Sebring as the two tested a Corvette for the 24-hour race at Daytona. “Junior went out first and in typical Junior fashion, it took him about six laps to figure out the limits and he crashed the car,” Fehan said. “Not to the point where it wasn’t repairable, but it’s not good when you crash. So he didn’t waste any time putting the pedal to the metal. When the team took a lunch break, Fehan had his crew bring out the mangled parts to the car and stack them by the table where he and the Earnhardts were eating. After lunch, a Sharpie was produced and the parts were all signed. They were indeed auctioned, but the money went to charity. “We went on to the third day of testing and everything went great,” Fehan said. Appropriately, also being inducted into the Sebring Hall of Fame this weekend is O’Connell. And rightly so, Fehan said. A 1,000 horsepower Corvette GTP competed in the IMSA Camel GT series in the mid-1980s. 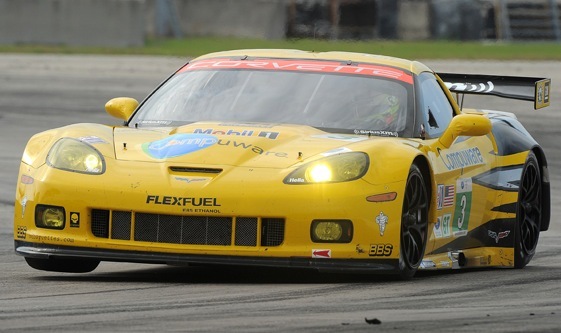 This weekend, re-tooled Corvette C6-Rs will compete in the GT class. The No. 03 Compuware Corvette is driven by Jan Magnussen (Denmark) and Antonio Garcia (Spain), with 20-year-old Florida college student Jordan Taylor making his Corvette Racing competition debut as third driver. Oliver Gavin (UK) and Tommy Milner of Lake Mary, Fla., will share the No. 4 Compuware Corvette C6.R, with Richard Westbrook (UK) reprising his role as third driver in the long-distance events. The green flag is scheduled to fall at 10:30 a.m. (EDT) Saturday, with live video on ESPN3.com. ABC will televise the race at 12 p.m. (EDT) on Sunday. And Corvettes and Fehan will be there.